"Are you tired, rundown, listless? Do you pop out at parties? Are you un-poop-ular?...Well are you?" 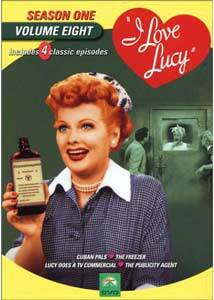 The episode that contains Lucy's side-splitting TV commercial for a health tonic generously laced with alcohol is the undisputed highlight of this quartet of I Love Lucy shows from the series' first season. In fact, the Vitameatavegamin bit constitutes one of the most memorable sequences from the entire series and still tickles the funny bone today. For a glorious ten minutes, Lucy fires on all cylinders, employing every weapon in her vast comic arsenal to terrific effect. It's impossible not to laugh at her brilliantly orchestrated antics and marvel at the talent that inspires them. That talent continues on display in the other three episodes of this collection, a perfect compliment to the previously reviewed Volume Seven. Lucy has lots of 'splaining to do after entangling herself in one slapstick mess after another, but it's the image of her holding a Vitameatavegamin bottle that continues to endure and delight. This volume features the same line-up of extras as the other Season One editions, with one notable exception�a book excerpt (featuring video clips) from the autobiography of series producer and writer Jess Oppenheimer. Lucy tries to impress a few of Ricky's Cuban friends, who have traveled to New York to appear at the Club Tropicana. She encourages Ricky to reprise a dance number he performed with a child prodigy a decade earlier, not realizing that in the intervening years the little girl has grown into a voluptuous Spanish siren. A jealous Lucy sends the dancer on an interminable taxi ride (courtesy of cabbie-in-disguise Fred) so she'll miss the performance, then dons the gown and plans to perform with Ricky herself. Her scheme, however, goes haywire when she finds herself trapped in an altogether different (and terrifying) production number. This episode offers Lucy several chances to shine, both physically and verbally. Whether she's trying to communicate with Ricky's Spanish-speaking friends or masquerading with Ethel as scrubwomen to spy on Ricky at the club, she always maximizes her material. But Lucy's at her best in her hilariously choreographed attempt to escape from the African tribal finale, dancing, clowning and miming with impeccable grace and timing. Unfortunately, Arnaz indulges himself with a dreadfully boring ballad that brings the comic momentum to a screeching halt, thus knocking down this episode's rating to 4 out of 5 hearts. When Lucy spots an ad for home freezers, she sees the perfect opportunity to economize. After all, she tells Ricky, with the money they'll save on meat, the freezer will soon pay for itself. Ricky doesn't buy her logic�or the freezer�but Ethel remembers that her uncle is closing up his butcher business and trying to unload his huge walk-in freezer. The girls secretly purchase it and have it installed in the basement of their apartment building. To complete their thrifty plan, they phone a wholesale butcher and each buy a side of beef. When the meat is delivered, both women are shocked at the volume, which exceeds 700 pounds. To avoid spilling the beans to their husbands, Lucy and Ethel try to unload the beef, then conceal it, all with humorous results. Of course, Lucy winds up locking herself inside the freezer, thus providing the memorable image of Lucy covered in frost and dripping with icicles, crying over another fine mess. Arnaz once again croons a couple of tunes, but they're well integrated into the plotline and thus not objectionable. As a result, this brisk episode rates a solid 4.5 hearts. Ricky makes the mistake of taking a business call within Lucy's earshot and divulges that he's seeking an actress to film a commercial for his upcoming TV show. Lucy's eyes widen and she begs for the job, but Ricky flatly turns her down, claiming she has no "'sperience." With Fred's help, Lucy plots to prove to Ricky that she's a TV natural by dismantling the Ricardo television, hopping inside and producing her own show. Her pathetic attempt does nothing to convince Ricky, who also discovers he'll be saddled with a major TV repair bill. Of course, Lucy doesn't take rejection lying down. When the TV actress calls the Ricardo home, Lucy tells her she's no longer needed and grabs the job herself. Lucy arrives on set and learns the product she'll be pitching is Vitameatavegamin, a nutritional elixir that's composed of vitamins, meat, vegetables, minerals and, unbeknownst to Lucy, alcohol. Lots of alcohol. Twenty-three percent alcohol! The script requires Lucy to sample a teaspoonful, but numerous run-throughs keep her sampling and sampling and sampling until she winds up a wee bit tipsy. By show time, she's a full-fledged drunkard and...you can guess the rest. Even an Arnaz solo can't derail Lucy's comic express train. The Vitameatavegamin commercial remains one of the series' most memorable sequences and one of the best examples of the genius that was Lucille Ball. 5 hearts. After Vitameatavegamin, what do you do for an encore? Any follow-up episode would be a letdown, but The Publicity Agent is doubly disappointing, straining credibility and patience by going further over the top than even Lucy's zany norm. The cast visibly labors for laughs and the script supplies few funny moments. One night while playing solitaire, Ricky complains, "I can't get my name in the papers; nobody's talking about me." He gripes about his publicity agent, wishing he could pay the $50-a-week salary to someone who really earns it. At the mention of fifty bucks, Lucy's ears prick up and she offers to take over the job. A bug-eyed Ricky spastically declines, but Lucy decides to work behind-the-scenes anyway to drum up notoriety for her husband. When she reads in the newspaper that the Shah of Persia fancies Benny Goodman records, Lucy latches onto the royalty angle and muses to Ethel, "If we just knew a countess or a princess who couldn't live without 'Babalu.'" Because they don't know one, they create one�the Maharincess of Franistan. Lucy masquerades as the fictional Arabian figurehead and makes quite a splash for Ricky, but when a Franistanian diplomat shows up and warns the Maharincess that she's in grave danger, Lucy begins to wonder whether she's wandered into real-life political intrigue. In this case, it's the writers who have some 'splaining to do about this sub-par script. The forced humor and preposterous premise keep this episode grounded at 2.5 hearts. Image Transfer Review: These episodes may not be pristine, but they're pretty darn close. A bit more surface debris crops up in these shows than the ones included on Season One, Volume Seven, but never enough to distract. Brightness levels also seem to be raised a notch or two, but thankfully the annoying shimmering that afflicted Volume Seven occurs to a far lesser degree here. Imperfections aside, it's a joy to revisit this series and zero in on all the visual details that were impossible to discern prior to the DVD transfer. I Love Lucy has never looked better, and now the video quality matches the series' superior writing and performances. Audio Transfer Review: The mono soundtrack serves its purpose, accurately and clearly transmitting the dialogue without any noticeable hiss or distortion. Upper registers can become slightly shrill, but then again, so can Lucy and Ethel. Arnaz' vocals sound especially warm and full, and the Club Tropicana orchestra possesses nice pop and presence. Extras Review: As mentioned above, the most notable extra included in this volume is a reading from Jess Oppenheimer's memoir, Laughs, Luck...and Lucy: How I Came to Create the Most Popular Sitcom of All Time. In a conversational style, reader Larry Dobkin relates some interesting facts and anecdotes about the series, including a behind-the-scenes look at how the writers constructed and modified The Freezer episode. Oppenheimer (series producer and head writer) also discusses Lucy's improvisational abilities and how an innocent slip-up forced her to reorganize the Vitameatavegamin routine on camera�with improved results. The almost 19-minute excerpt features video clips from both The Freezer and Lucy Does A TV Commercial to illustrate Oppenheimer's remembrances. As was noted in the Volume Seven review, the guest cast biographies prove especially interesting, as Lucy's show boasted a veritable stock company of returning performers. The brief bios list all the episodes in which these cast members appeared, along with their connection�sometimes quite circuitous�to Lucy. Two flubs are included, both of which remain in their respective episodes. In Cuban Pals, Arnaz speaks English instead of Spanish to his visiting friends and breaks up, taking more than a moment to compose himself before continuing the scene. He recovers nicely, making it difficult to discern whether the flub was scripted or not. The other error occurs in Lucy Does A TV Commercial when the TV show stage manager complains that Lucy has disappeared. Sharp eyes can spot her hidden in the wings awaiting her cue. Many of the I Love Lucy episodes borrowed elements from My Favorite Husband, Lucy's popular radio show that inspired her TV series. Selling Dresses is an especially entertaining installment that follows Lucy (Liz Cooper in the show) as she buys dresses from one department store and returns them at another�for a profit. The writers reworked a specific scene from Selling Dresses for I Love Lucy's The Freezer, substituting wholesale beef for retail gowns. In addition, some negligible special footage from Lucy Does A TV Commercial, as well as the series' original�and weaker�opening title sequence round out the extras package. While I Love Lucy, Season One, Volume Eight offers up three solid episodes, the Vitameatavegamin routine alone makes this disc worth owning. It presents the Queen of Comedy in top form, in total command of her art, material, and audience. No collection of classic TV should be without it.